A vicious low pressure on our doorstep took us all by surprise. Deceptive to say the least. It veered north and the rest is history. How many of you remember the Great Storm of October 1987? It left most of southern England devastated and millions of trees uprooted on both sides of the English Channel. The storm also left an indelible memory and sense of loss, even bereavement as so many giant oaks were felled in a single night. 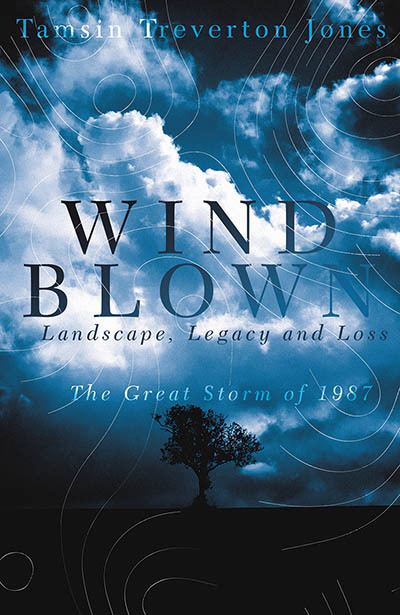 Thirty years have now past since that devastation and to mark the event the writer and poet Tamsin Treverton Jones has written a book aptly enough called Windblown. She has painstakingly researched and collated a vast range of individual stories most of which have never been heard before. Expertly she weaves the stories into a compelling tale, which unfolds and branches out almost like a novel where the strength of the wind wreaks havoc rather like in the Tempest and the ancient trees are the central tragic characters surrounded by the living, the mourners aghast at the tragedy unfolding. Even the BBC’s weatherman Michael Fish famously failed to spot the storm’s imminent menace, though in all fairness it was not technically a hurricane. His playing down of the situation lulled the nation into a false sense of security. The weathermen knew it was coming but could not predict its speed and ferocity or indeed where it would hit the coast. Computer predictions did not have the same muscle and clout that they have today. The weathermen also still relied on manned weather ships barometers, wind gauges and weather balloons as well as verbatim reports. Most mariners sniffed the air, used their instinct and very wisely fled for the nearest port and waited for the storm to pass. On the night of 15th/16th October 1987 the storm sped up from the Bay of Biscay raced through the Western Approaches and very inconveniently devastated the cider orchards of Brittany and Normandy before finally coming ashore in Dorset. The storm took a short cut, turned inland then worked its way relentlessly through the towns and forests of Hampshire, Sussex, Surrey, Middlesex. Kent. Hertfordshire, Essex and East Anglia before leaving these shores. The whole south east corner of England was awash with fallen trees and nowhere was this more lamented that at Kew Gardens where nearly 1,000 mature trees were damaged or uprooted. London and the commuter belt were well and truly hammered. By writing this book, Tamsin Treverton Jones has followed in the footsteps of another much earlier intrepid storm reporter and raconteur, Daniel Defoe who cut his teeth on the Great Storm of 1703 which devastated Somerset. She has turned reportage into an art form and as well as trailing through newspaper reports, weather records, libraries and record offices she has cleverly used the story of her own family story. Tamsin has also tracked down and interviewed lighthouse keepers on the Needles, fishermen, farmers, foresters and sailors, sculptors, refugees, as well as orchard growers in Kent and Gloucestershire. Then what to do with all the wood? Sawmills were inundated. There were some innovative ideas at Kew. Tamsin’s father Terry Thomas designed a stunning 10ft x 5ft wooden mural from pieces extracted from the fallen exotic trees at Kew which depicted Chinese Lions defending Kew against the evil wind. The pieces were then cut and fashioned by Robert Games. John Makepeace OBE, then of Parnham House, Beaminster was also given some salvaged mulberry wood and American Walnut from Kew which he turned into cabinets and a memorable table shaped like a twelve-foot long leaf. A brace of lute makers also benefited. Added to all this creativity is the ongoing debate of legacy, loss and natural regeneration, the philosophy and ethics of timber re-growth and management, tree planting, tree roots and the story of nature’s ability to reinvigorate itself after the catastrophic 300 year storm. Tamsin studied French at Bristol University and is no stranger to Literary Festivals or the Theatre. She was head of Press at the Royal Shakespeare Company, The Royal Court Theatre and Bath Literature festival. She is a real live wire and this promises to be an excellent event.